Do you need new boat covers? Boat covers need to last for many years, look good and be functional. At Canvas Barn Marine Trimming we understand your boat covers should enhance your boating experience. Great boat covers should make your boating lifestyle more comfortable while protecting the investment that is your boat. So if this is what you are after, we can make the right boat covers to do this for you! Aaron Stroud and the team at Canvas Barn Marine Trimming are able to tackle your whole job, from start to finish. First, we talk to you, and find out how you use your boat. This step is vital to make sure you get exactly the type of boat covers to suit your needs. We’ll talk about the alternative fabrics to use, the clear vinyl choices, the colours and the selection of zips and fittings., and what maintenance is involved. Next, we work with the lines of the boat as we design the frame, then manufacture that frame in stainless steel. When your frame is complete, we make your boat covers to fit that frame. No boat will have exactly the same cover as any other boat – they are all bespoke. Lastly, we’ll teach you how to fit your boat covers and how to care for them over the coming months and years. If you are looking for cushions and interiors, we make sure you get the comfort and style your boat deserves. We make cushions shaped exactly to your boat, and use the right fabric for the job. and more, we can make them for you. Check out our Galleries! 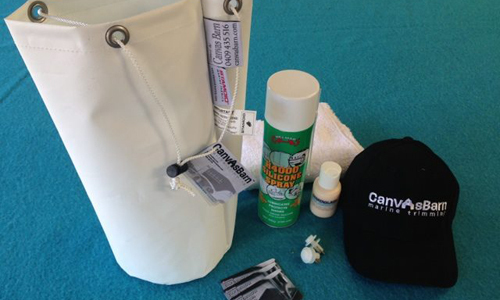 Canvas Barn Marine Trimming looks forward to making your boat covers.